The average 30-year fixed rate mortgage (FRM) rate increased slightly to 3.53% during the week ending August 26, 2016. The 15-year FRM rate also increased slightly to 2.69%. FRM rates have remained relatively low during the recovery from the Great Recession due to near-zero short-term borrowing rates set by the Federal Reserve (the Fed). The Fed raised the short-term rate by 0.25% on December 17, 2015 following seven years at essentially zero. However, FRM rates will not see the ripple effects of the rate hike until 2017. In the meantime, FRM rates will continue to remain low due to the present lack of investment opportunities for the excess sums now placed in bonds and on deposit with the Fed. Interest rates will likely stay low for several months, though movement will depend on the next direction of the global economy. A strengthening bond market due to a slowing global economy will keep interest rates and mortgage rates down. Increased global investment in the 10-year Treasury Note indicates the rate on the 10-year T-Note will also remain low over the next several months, FRM rates following in tandem. As of August 26, 2016, the 10-year T-Note rate is at 1.63%, up from the prior week. Lenders use the 10-year T-Note to determine a homebuyer’s mortgage rate. The difference between the note rate and the 10-year T-Note rate represents the lender’s risk premium. The risks are the potential losses due to mortgage defaults on less than 20% down payment transactions, covered by private mortgage insurance (PMI). The spread between the 10-year T-Note and 30-year FRM rate dropped to 1.90%, still above the historical difference of 1.5%. The elevated spread indicates lenders are overcharging homebuyers for mortgages to profit from excessive risk premiums. These overpriced mortgages – along with the deceleration in home sales volume since October 2015 due to excessive home pricing – are contributing to the reduction in purchase-assist originations and, as a result, the current slowdown in residential construction, putting a damper on real estate sales volume. As of August 2016, the average rate on adjustable rate mortgages (ARMs) fell to 2.92%, above its low point of 2.49% experienced in May 2013. ARM use has gradually risen due to home prices rising faster than the rate of pay, causing buyers to take on more risk to extend their purchasing power. 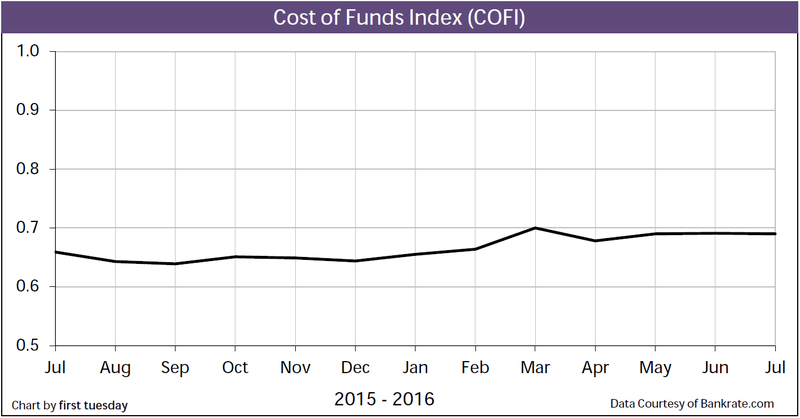 The Fed’s short-term interest rate hike at the end of 2015 caused ARM rates to rise proportionately – around 0.25% – and they will further rise when the Fed again raises rates. Updated 08/26/2016. Original copy released 03/13/2012. Beginning January 2016, the average 30-year FRM rate in California is provided by Bankrate.com. Prior to January 2016, the 30-year FRM rate is provided by Freddie Mac’s survey of the Western Region of the U.S, which includes CA, AZ, NV, OR, WA, UT, ID, MT, HI, AK, and GU. Beginning January 2016, the average 15-year FRM rate in California is provided by Bankrate.com. Prior to January 2016, the 15-year FRM rate is provided by Freddie Mac’s survey of the Western Region of the U.S. The average 15- and 30-year conventional commitment rates are the rates at which a lender commits to lend mortgage money in the United States-West for the duration of the life of each respective mortgage as reported by Freddie Mac. 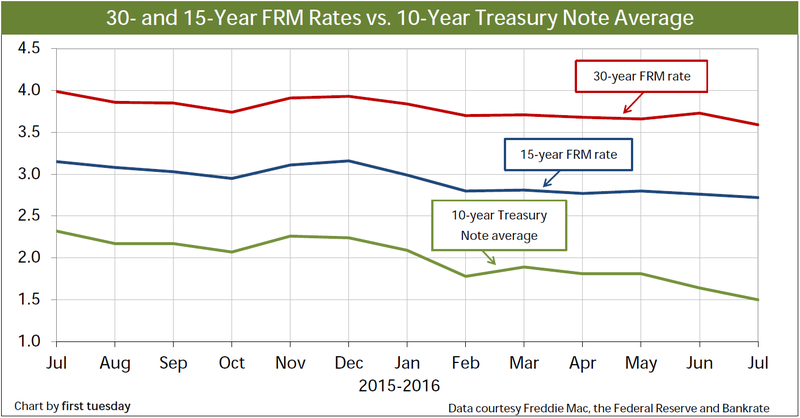 The green line reflects the 10-Year Treasury Note Average, a leading indicator of the direction of future Freddie Mac rates. It is comprised of the level of worldwide demand for the dollar and anticipated future domestic inflation. This index is one of several indexes used by lenders as stated in their ARM note to periodically adjust the note’s interest rate. 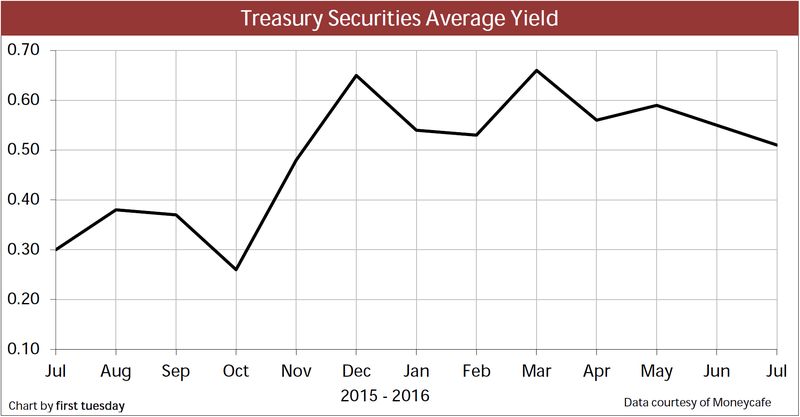 This figure is an average of the one-year T-Bill rates for the past 12 months.The ARM interest rate equals the 12-Month Treasury Average yield plus the lender’s profit margin. There is a one-two month lag in data reporting for the 12-Month Treasury Average. This index is one of several indexes used by lenders as stated in their ARM note to periodically adjust the note’s interest rate.The ARM interest rate equals the LIBOR rate plus the lender’s profit margin. The rate is set by the banks in London, England. These rates determine minimum interest yield reportable on carryback financing. The AFR category is determined by the carryback due date. *Rates are for monthly payments. NextDo extensive pre-eminent domain tests and studies constitute a taking of property?